My love of biscuits is well documented, and I have a go to recipe from America’s Test Kitchen. It uses cream as a shortcut so there’s no need for cutting in the butter and all that kneading. But, I had a lot of buttermilk left over from the cinnamon rolls and decided to try a new recipe, from Food.com. The biscuits come together easily with the help of a food processor. The recipes says it makes 10, but I got 6 generously sized biscuits. I also brushed the tops with a little buttermilk and a sprinkle of sea salt before they went in the oven. The biscuits were tender and fluffy - delicious with a pat of butter and dollop of jam. They were still great the next morning, when I made an egg, bacon and cheese biscuit sandwich. 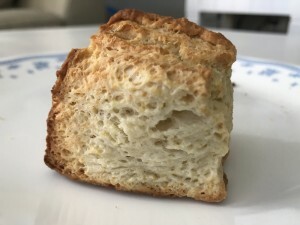 I’m still loyal to the ATK recipe, simply because buttermilk is not a staple in my household, but when I do have buttermilk, I’ll be making these again.